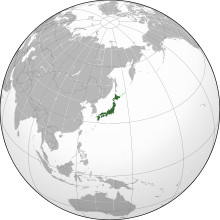 Japan (日本, Nippon) is a country in Asia. It has many islands. Four of them are big, and the biggest is the 7th largest island in the world. This island is called Honshu. The islands are near the east Asian coast, in the western part of the Pacific Ocean. Japanese people call their country "Nihon" or "Nippon", which means "the origin of the sun" in Japanese. The earliest records on Japan are from Chinese documents. One of those records said there were many small countries (in Japan) which had wars between them and later a country, ruled by a queen, became the strongest, unified others and peace came. The Japanese began to write their own history after the 5th and 6th centuries, when people from Korea and China taught Japan about the Chinese writing system. Japan's neighbours also showed them the ways of Buddhism. The Japanese changed Buddhism in many ways, for example, by building strongly on ideas such as Zen, which came from mainland Asia. In the ancient and the Middle Ages, China gave Japan many new cultural ideas, but their friendship became weaker later. In the late 13th century, Mongolians from China tried to invade Japan twice, but they could not. Japan had some contact with the Europeans in the 16th century. The Portuguese were the first Europeans to visit Japan. Later, the Spanish, English and Dutch came to Japan to trade. Also, they brought Christianity. Japan's leaders welcomed them at first, but because Europeans had conquered many places in the world, the Japanese were scared they would conquer Japan too. So the Japanese did not let the Europeans come into Japan anymore, except in a small area in Nagasaki city. Many Christians were killed. Only Chinese, Korean and Dutch people were allowed to visit Japan, in the end, and they were under careful control of the Japanese government. Japan was opened for visitors again in 1854 by Commodore Matthew Perry, when the Americans wanted to use Japanese ports for American whale boats. Perry brought steamships with guns, which scared the Japanese into making an agreement with him. This new contact with Europeans and Americans changed the Japanese culture. The Meiji Restoration of 1868 stopped some old ways and added many new ones. The Empire of Japan was created, and it became a very powerful nation and tried to invade the countries next to it. It invaded and annexed Ryukyu Kingdom, Taiwan, and Korea. It had wars with China and Russia: the First Sino-Japanese War, the Boxer Rebellion the Russo-Japanese War, and the Second Sino-Japanese War, which grew to become a part of World War II. In 1941, Japan hit Pearl Harbor in Hawaii, a water base of the United States and destroyed or damaged many ships and airplanes. This started the United States' involvement in World War II. American and Japanese forces fought each other in the Pacific. Once airbases were established within range of the Japanese mainland America began to win, and started dropping bombs on Japanese cities. America was able to bomb most of the important cities and quickly brought Japan close to defeat. To make Japan surrender, the United States dropped two atomic bombs on the cities of Hiroshima and Nagasaki, killing 150,000 Japanese citizens. Soon after this the Soviet Union began to fight against Japan and the Japanese army in Manchuria lost. Japan surrendered and gave up all the places it took from other countries, accepting the Potsdam Proclamation. The United States occupied Japan and forced it to write a new constitution, in which it promised to never go to war again. In the middle of Japan there are mountains. They cover the middle of the islands and leave a very narrow strip of flat land on most coasts. Many of the mountains are extinct volcanoes, but some are still active. The highest of these mountains is the beautiful, volcano-shaped Mt Fuji (3776m or 12,389 feet high). Japan has many earthquakes, in fact there are about 1500 of these every year. The most recent big earthquake was in 2011 - called '2011 Tohoku Earthquake'. It caused great damage to several power plants forcing Japan to shut down all its nuclear plants. There was nuclear core meltdown which caused a serious health risk to nearby villages and cities. The ruling party is the Liberal Democratic Party (Japan) and prime minister is Shinzo Abe. In the past, much science in Japan was learnt either from China, or from Europe in the Meiji Era. However in recent decades Japan has been a leading innovator in several fields, including chemical engineering, nanotechnology and robotics. There are many technological companies in Japan, and these companies make products for export. Many things in Japanese culture originated in China, for example Go, and bonsai. See also Tea ceremony, Noh, Kabuki, manga, anime, Bunraku. The religion in Japan is mostly Shinto and Buddhist. There are small numbers of Christians and Muslims, and a few Jews. Japan has 4 problems about territory. It cannot agree with some neighbouring countries on whether the land belongs to Japan or the other country. Japan has many traditional sports such as sumo, judo, karate, taido and kendo. Also, there are sports which were imported from the West such as baseball, soccer, golf and skiing. Japan has taken part in the Olympic Games since 1912. It hosted the Olympic Games in 1964, 1972 and 1998. From 1912 until now, Japanese sports people have won 398 medals in total. ↑ "法制執務コラム集「法律と国語・日本語」" (in Japanese). Legislative Bureau of the House of Councillors. http://houseikyoku.sangiin.go.jp/column/column068.htm. Retrieved 19 January 2009. ↑ "World Factbook: Japan". CIA. https://www.cia.gov/library/publications/the-world-factbook/geos/ja.html. Retrieved 15 January 2011. ↑ "Japan Statistical Yearbook 2010". Statistics Bureau. p. 17. http://www.stat.go.jp/data/nenkan/pdf/yhyou01.pdf. Retrieved 15 January 2011. ↑ "Official Japan Statistics Bureau estimate". Statistics Bureau. http://www.stat.go.jp/english/data/jinsui/tsuki/index.htm. Retrieved 25 August 2010. ↑ "Preliminary Counts of the Population and Households". Statistics Bureau. http://www.e-stat.go.jp/SG1/estat/ListE.do?bid=000001029548&cycode=0. Retrieved February 25, 2011. ↑ 7.0 7.1 7.2 7.3 "Japan". International Monetary Fund. 2011. http://www.imf.org/external/pubs/ft/weo/2011/02/weodata/weorept.aspx?sy=2010&ey=2016&scsm=1&ssd=1&sort=country&ds=.&br=1&pr1.x=25&pr1.y=8&c=158&s=NGDPD%2CNGDPDPC%2CPPPGDP%2CPPPPC&grp=0&a=. Retrieved 30 September 2011. ↑ "World Factbook: Gini Index". CIA. https://www.cia.gov/library/publications/the-world-factbook/fields/2172.html. Retrieved 11 May 2011. ↑ "Human Development Report 2011". UN. 2011. http://hdr.undp.org/en/media/HDR_2011_EN_Table1.pdf. Retrieved 5 November 2011. ↑ 10.0 10.1 10.2 10.3 10.4 "Japan". CIA World Factbook. CIA. https://www.cia.gov/library/publications/the-world-factbook/geos/ja.html. Retrieved 2009-06-16. ↑ 11.0 11.1 "Early Japan (until 710)". 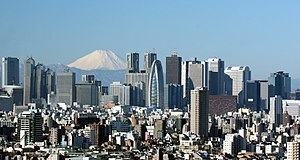 japan-guide.com. http://www.japan-guide.com/e/e2131.html. Retrieved 2009-06-16. ↑ "Perry & Opening of Japan". history.navy.mil. 2009 [last update]. http://www.history.navy.mil/branches/teach/ends/opening.htm. Retrieved December 1, 2011. ↑ Nussbaum, "Sports" at pp. 905-907. This page was last changed on 18 December 2014, at 23:04.